When the weather starts warming up, one of my very favorite things to do is spring clean my closet. I love pulling out all the sweaters and boots, and replacing them with sandals and sundresses that have been packed away for the last few months. And of course it’s always fun to add a few new things to the mix once your closet is all emptied out! 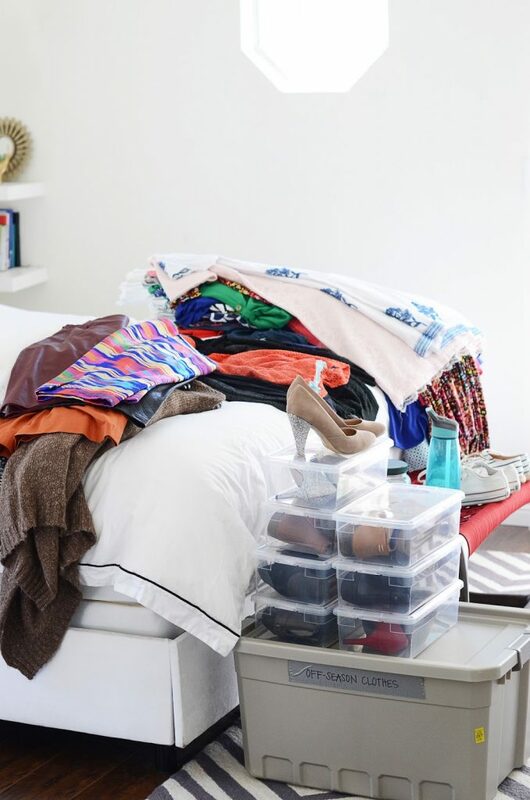 So I’ve teamed with Zappos today to share 5 tips for cleaning out your closet, and then share a few spring essentials to help refresh your wardrobe after a long winter! Zappos has free 2-day shipping, so after that closet is clean, you can have your new items in your closet in a flash! 2. Be honest with yourself about what you really wear. There are always a few pieces in my closet that I just can’t let go of for some reason. I think, “I’ll totally wear that this summer,” when in reality it’s sat unworn for the last two summers. A good rule of thumb (that I sometimes still break, obviously) is that if I haven’t worn it in the last nine months (unless it’s seasonal), then it’s time to get rid of it. 3. Make piles. Although your room will be a complete disaster as you spring clean your closet, making piles will help organize the chaos. I make a “Throw Away” pile, a “To Sell/Donate” pile, and a “Needs Repairs/Alterations” pile, and it helps me keep everything somewhat organized and contained as I clean. You can see my piles and stacks in the pictures above. 4. Sort your clothing as you put it back in your closet. After I clean my closet, I want it to stay clean and organized as long as possible. 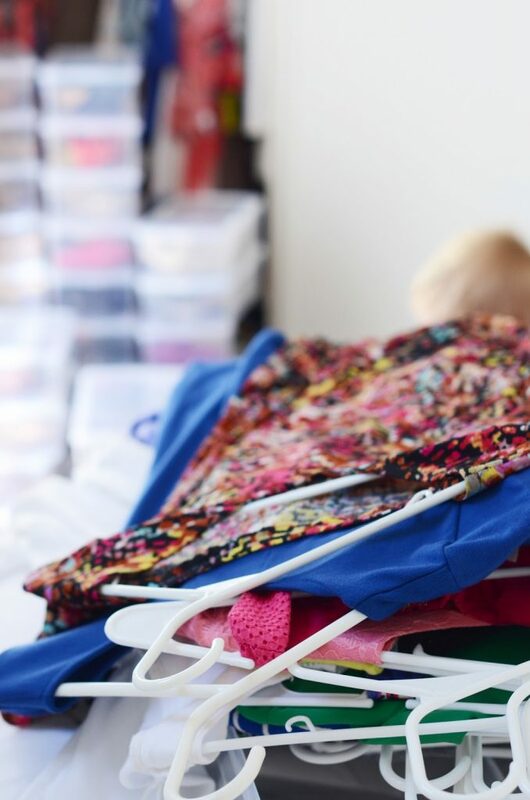 The best way I’ve found to keep it organized is to sort it by item — skirts all hung together, then dresses, then blazers and jackets, and then regular tops, and then sort by color within each of these categories (I do it in rainbow order). Then as I put items away at the end of the day, I know just where they belong. I also store my shoes in these boxes from The Container Store, and not only does it keep them protected, it gives me more storage since I can stack them on top of each other inside my closet. 5. Refresh your wardrobe. 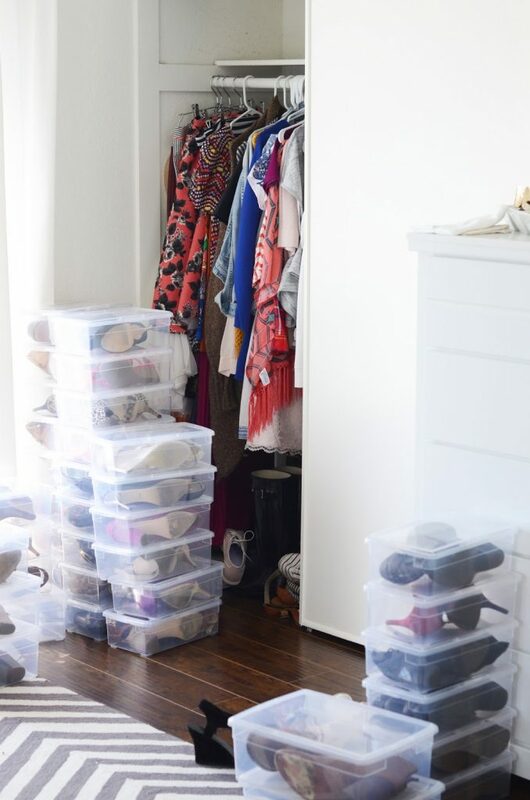 Once you have everything sorted and organized by item type and color, it’s easy to recognize any gaps you might have in your closet. You can clearly see that you don’t own anything in cobalt blue (but you want to! ), or you don’t have a single white sundress (and obviously that’s a summer essential!) So now comes the fun part — refreshing your wardrobe with a few new things! Zappos has an amazing selection of clothing, handbags, shoes, and accessories, so they’ll help you fill in the gaps so easily. They also have free 2-day shipping, so your closet will be refreshed and ready for spring in no time at all! As I did my closet spring cleaning this year (which you can see snippets of in the pictures above) I realized I didn’t own a pink purse. And since this is the season of pink for me, that was first on my list of purchases. I found this gorgeous crossbody Michael Kors bag from Zappos, and it’s the perfect investment piece to refresh my wardrobe now, but will also last me for years, since I’m trying to be better about buying quality items that won’t fall apart before next summer! I paired my new bag with an all-white look for summer — white denim and a white eyelet top — and a pair of simple espadrille wedges, all of which are spring and summer essentials in my closet too! Now go clean out your closet, and then refresh it with some fun pieces with Zappos! Which items are top on your “to-buy-for-spring” list?? I may use your advices in a little while as I am moving soon 😉 Thanks a lot for sharing. May I ask you where you have found the plastic boxes for your shoes? There are great. they’re from The Container Store! Love this post! I seriously need to clean out my closet! Thanks for the advice! Love your look here too! Oh goodness…I really needed this post!! It’s time for some spring cleaning in my house! I find number 2 to be the most helpful when I’m cleaning my closet. If I’m not wearing my clothes, someone else can. I take clothes to Buffalo Exchange a couple of times a year. My closet is always in rotation. Love the all white look! Such great tips! I have such a hard time knowing when to get rid of things! Love the all white look too! Great tips. I’m so bad at cleaning out my closet! And I LOVE your all white look with the pink bag. Love your all white look with the pop of pink. So refreshing. Intrigued by how you organize your shoes. Do the tubs take up a lot of space? I like that it protects the shoes. I’m totally the same way! Cleaning it out reminds me of so many things I haven’t worn in ages! I am in love with that pink bag!! I never thought about plastic containers for shoes. Wonderful idea!! I will have to steal that for my closet. It is so unorganized. 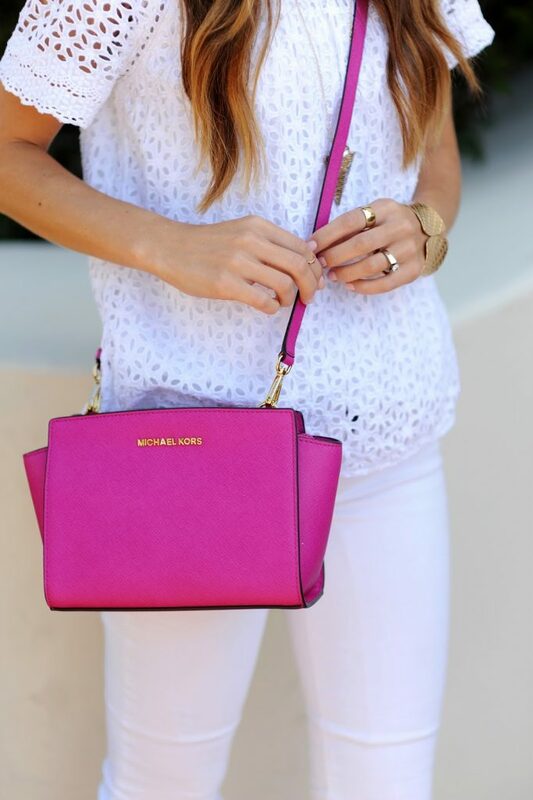 Love the pretty white eyelet top and the pop of pink from the bag is absolutely delightful! Thanks for the tips on wardrobe organization too!